Dr. Steven Carrell is a graduate of Texas Chiropractic College. He graduated in 2013 with his Bachelors in Human Science and with his Doctorates of Chiropractic degree. He was raised in Kingwood and still has family in the Kingwood area. Dr. Carrell can speak Spanish, Portuguese, and English. He lived overseas in Portugal from 2005 to 2007 doing ministry work. Dr. Carrell’s true passion has always been about serving others and making a difference in their lives and making them feel better. Dr. Carrell and his wife Chelsea have two beautiful boys whose names are Grayson and Jaxson. They are the love of his life and his pride and joys. Dr. Carrell enjoys being in the water and swimming with his children, camping, jet skiing, boating and wake boarding. 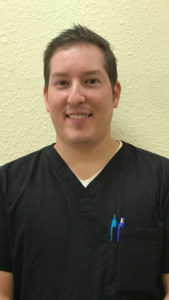 Dr. Carrell’s accomplishments include running one of the most successful chiropractic franchises in the United States, running another successful Personal Injury chiropractic clinic, and being an Eagle Scout.